Roland Ortmayer (known to all around him as Ort) was the most unconventional football coach I have ever read about. He coached for 43 years at La Verne, but never won a conference championship outright and never produced a successful pro player. 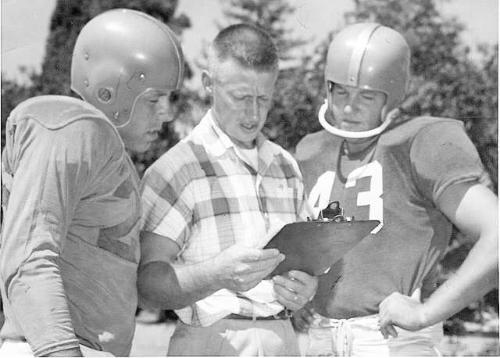 When Looney interviewed him for the SI article, Ortmayer described himself as “a teacher, a kayaker and a rafter, a fly-fisherman and a mountain climber, not to mention being a husband, father and grandfather.” Regarding the omission of coaching from his resume, Looney wrote that doing so seemed fitting since calling Ortmayer a football coach would be like “praising Picasso for knowing the primary colors.” Ort was so much more than a coach. Ort’s unorthodox approach to coaching included no recruiting, no mandatory practices, no weight training, and no playbook. Ort washed the team’s towels, socks, and jocks and scrubbed the grass stains out of the practice and game uniforms. Ort never cussed. “Oh, crum” was as profane as he ever got. Ort’s teams won about half the time and lost about half the time, which seemed like a reasonable balance to him. Those who played football for Ort praised him for the difference that he made in their lives and the “larger than football” lessons that he imparted to them. Roland Ortmayer passed away on October 9, 2008 at the age of 91. You can read Looney’s archived article at SI Vault. Reading it can still bring a smile to my face and a tear to my eye.